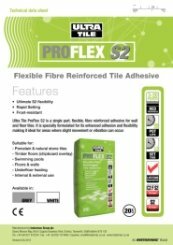 Ultra Tile ProFlex S2 is a single part, flexible, fibre reinforced adhesive for wall and floor tiles. It is specially formulated for its enhanced adhesion and flexibility making it ideal for areas where slight movement or vibration can occur. Classified C2 F S2. Available in White and Grey.